An evening with world-renowned photographer and documentarian Annie Leibovitz will culminate a spectacular 2009-10 University Lectures season at Syracuse University on Thursday, April 29. This lecture is an addition to the previously announced University Lectures schedule. Leibovitz will share selections of her work during the lecture, which begins at 7:30 p.m. in Hendricks Chapel. The event is free and open to the public; reduced-rate parking is available in the Irving Garage. A sign language interpreter and CART will be available during the lecture. The lecture is sponsored in cooperation with the S.I. Newhouse School of Public Communications. 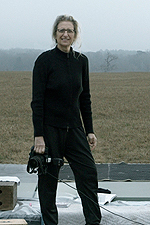 Leibovitz began her career as a photojournalist for Rolling Stone in 1970 while she was a student at the San Francisco Art Institute. Her photos have appeared regularly on magazine covers ever since, and her large and distinguished body of work encompasses some of the most well-known portraits of our time. Leibovitz’s first major assignment was for a cover story on John Lennon. In 1973, she became chief photographer for Rolling Stone, where she shot 142 covers and published photo essays on scores of stories, including her memorable accounts of the resignation of Richard Nixon and of the 1975 Rolling Stones tour. In 1983, she joined the staff of the revived Vanity Fair and was established as the foremost rock music photographer and an astute documentarian of the social landscape. At Vanity Fair, and later at Vogue, she developed a large body of work—portraits of actors, directors, writers, musicians, athletes and political and business figures, as well as fashion photographs—that expanded her collective portrait of contemporary life. Several collections of Leibovitz’s work have been published, and exhibitions of her work have appeared at museums and galleries all over the world. She is the recipient of many honors and recognitions. In 2009, she received the International Center of Photography’s Lifetime Achievement Award, ASME’s first Creative Excellence Award and the Centenary Medal of the Royal Photographic Society in London. Leibovitz has been designated a Living Legend by the Library of Congress. The Office of University Lectures welcomes suggestions for future speakers. To recommend a speaker, or for additional information about University Lectures, please contact Esther Gray in the Office of Academic Affairs at 443-2941 or eegray@syr.edu. More information can be found at the University Lectures website, http://lectures.syr.edu.